Freiberg, H.J. (2013). 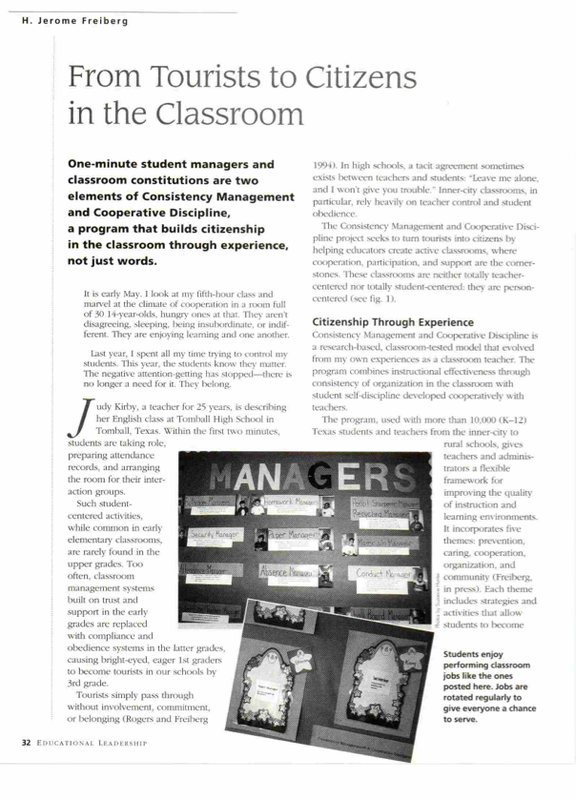 Classroom Management and Student Achievement. In J. Hattie and E. Anderman, (Editors), International Guide to Student Achievement (pp. 228-230). Routledge Publishers. Freiberg, H. J., Templeton, S., & Helton, S. (2013). Classroom management: A pathway to improving school climate in two British secondary schools. In M. Newberry, A. Gallant, & P. Riley, (Eds. ), Emotion in school: Understanding how the hidden curriculum influences relationships, leadership, teaching and learning (pp. 203-225). Bingley, United Kingdom: Emerald. Freiberg H.J., Huzinec C., & Templeton S. (2009), Classroom Management—A Pathway to Student Achievement: A Study of Fourteen Inner-city Elementary Schools. Elementary School Journal, 110(1), 63–80. Freiberg, H. J., Huzinec, C. A., Rubino, C., Borders, K., Williams, L., & Alexander, R. (2011). The effects of a prosocial classroom management program on student achievement and behavior at a reconstituted inner city ninth-grade academy. Presented at the American Educational Research Association Annual Meeting, New Orleans, LA. Freiberg, H.J., Huzinec, C.A., & Borders, K. (2008, March 24-28). The effects of classroom management on student achievement: A study of three inner-city middle schools and their comparison schools. Paper presented at the 2008 American Education Research Association (AERA) Annual Meeting, New York, NY. Freiberg, H.J. & Reyes, A. (2008). Zero tolerance: A reconsideration of policy and practice. In T. Good (Ed. ), 21st century education: A reference handbook (pp. 149-157). Thousand Oaks, CA: Sage Publications. Freiberg, H.J. (1998). 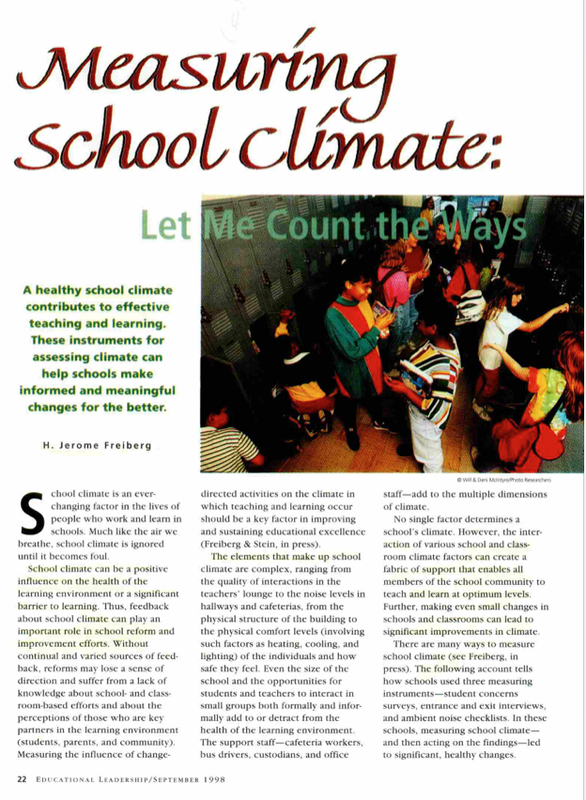 Measuring school climate: Let me count the ways. Educational Leadership, 56, 22-26. Freiberg, H.J. (1996). From tourist to citizens in the classroom. Educational Leadership, 54, 32-37. Freiberg, H. J. (2002). Essential skills for new teachers. Educational Leadership, 59, 56-60. 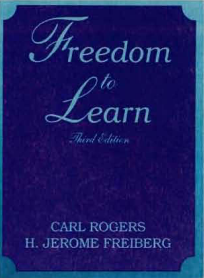 This book was developed as a result of the classroom Management Special Interest Group at the American Educational Research Association (AERA), because it became apparent that many educators were looking for alternatives to the current paradigm of behaviorism that is currently so prevalent in the American classroom. 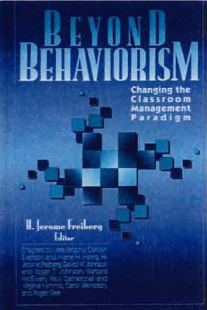 This edited volume, includes chapters by many of the leaders in the classroom management field and is designed to examine the philosophical underpinnings of behaviorism and show why the change is needed. Emphasizes bridging the gap between theory, research, and practice with a clear and concise style that teachers will surely enjoy integrating into their own classrooms. 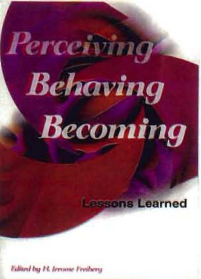 Riggi resents teaching from three specific actions-organizing, instructing, and assessing-and is divided into three sections, which reflect each of these teaching actions. The strategies presented in each section are truly universal in nature-they cut across grade levels, subject areas, and teaching situations. 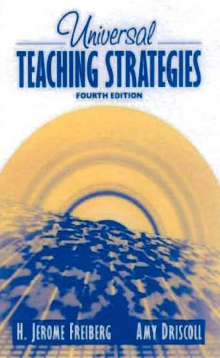 With clear and effective writing and a decision-making framework that combines the context, content, and learner with what teachers need in the real WOrld-organizing, instructing, and assessing-Universal Teaching Strategies expands both the pedagogical teaching knowledge of teachers and their instructional repertoires. School Climate is designed to meet the needs of school and district administrators, teachers, school board and community members who want answers to the questions: How Are We Doing? How Healthy Is Our Learning Environment? Authors from four nations are represented in this book, including Australia, Israel, The Netherlands and the United States. 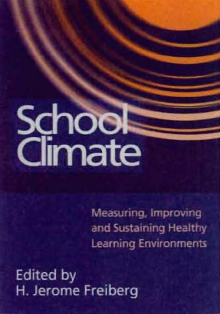 This book provides 18 climate instruments and approaches to measure climate from multiple perspectives including, student, teacher, parent, community, and administrator perspectives.